So we are very nearly two-thirds of the way through the FlickFleet Kickstarter campaign and we are just over two-thirds funded. Which is alright I think, according to Kickstarter themselves 98% of campaigns that reach 60% end up funding, so I'm still optimistic, but the last week or so have been very flat and a test of our nerves. We've now had a few days where the total was slightly negative and lots where the total was barely above zero - we're really hoping for a big jump on the last few days (which it seems most campaigns have). Running a Kickstarter campaign that doesn't fund immediately is incredibly stressful, especially watching the pledges come in and then get cancelled. I wouldn't recommend it for the anxious. Still there are some signs of hope, I'm being interviewed by Paul Grogan of Gaming Rules! while I'm in the US this week, and hopefully Geek & Sundry too. The podcast interview with Coaching for Geeks goes live next weekend and we've got a decent number of people who are following the project and will be notified at 48 hours before it closes. So there's 530 people who are interested enough to get a notification, but haven't yet backed. We’re now on day 12 of our 30 day Kickstarter campaign for FlickFleet. After a strong start we’re now in the doldrums. The daily pledge total is usually around £250-£400 (we need £246 on average every day to fund) and once it was as low as £45, so we’re limping towards the line, but it’ll probably go to the wire. Most people I’ve spoken to are convinced we’ll fund (or at least that’s what they are telling us!) and Kicktraq and Backerkit’s trend analysis both have us funding too. 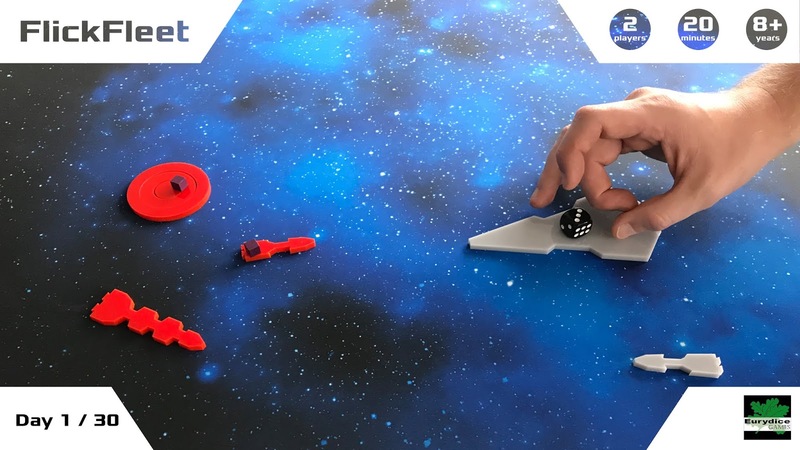 The only concern is that Kicktraq’s lower limit from its projection cone is now under our goal £10,787 vs £12,000, and it’s heading lower each day (even if their trend is to £18k!). I’ve spoken before about my concerns about Kickstarter (Exhibit A & Exhibit B) but it turns out the biggest problem I’m (and Paul said he is) experiencing is actually the worry about will we fund. Frequently checking the total has become compulsive behaviour, which can’t be healthy. We’ve had quite a few cancellations and no information from almost all of the cancelling pledgers to help us understand why they backed (often at a high level) only to cancel hours or days later. The one exception to that was a guy who backed and then in response to my thank you message told me how cool the game looked and how much he was looking forward to playing it with his kids. A few days later I got another message from him to say that he was cancelling that pledge because budgets were tight at this time of year. He still loved the game and the campaign, but just couldn’t afford it at the moment. I really appreciated the explanation and tweeted as much. We're just under 5 days into our FlickFleet Kickstarter campaign and it's pretty intense. It seems to be going well so far (just over 40%) and there have been a couple of surprises. First up is the deluxe editions are way more popular that we were expecting - I hoped we'd get a few pledges at that level by the end but they all went withing 15 hours! Crazy. 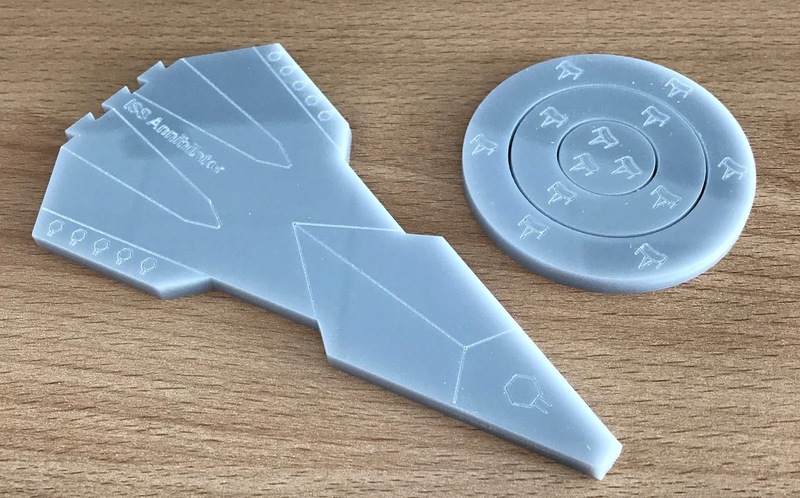 After discussion with Paul (who will be doing the laser cutting) we've just added a few more with a later delivery date (though still ahead of the standard copies). The other thing is the number of backers we're getting directly from Kickstarter. It's over 40% which really surprised me, especially as we've not made any top picks lists or anything. Anyway, it's all going pretty well I think, but I could really do with some sleep! Hopefully I'll get a decent night on Tuesday when I'm away for work (and getting interviewed by Gabe Barrett from The Board Game Design Lab for his podcast!). 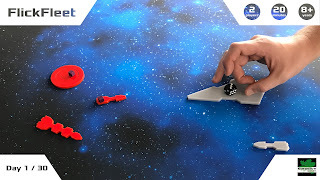 After months of wrangling with the Kickstarter page and trying to get to grips with the concept and best practices of crowdfunding, FlickFleet is finally live on Kickstarter. We're about 6 hours in at time of writing, with 20% of the target pledged - huge thanks to all the early backers - Paul and I really appreciate your support. Please take a look at the page and share with anyone you think would enjoy it. Right, I'm off to bed now - I've not slept much in days and today's excitement has done for me! I’m currently on holiday (writing this while The Toddler naps) so I’ll keep this brief! FlickFleet is coming to Kickstarter on Thursday, hopefully about 4pm UK time. It’s our first time on Kickstarter and despite the slow growth of our mailing list and a number of very excited people by far the biggest risk is that we won’t have enough backers to hit our target. If you are intending to back it (thanks! ), please do so early to help give us the appearance of momentum which might encourage others to join in. If you don’t wish to back the project, please share it with one or two people who you think might be interested - it might be the difference between success and failure!